"I've been here for 15 hours, as always. I'm a super fan. 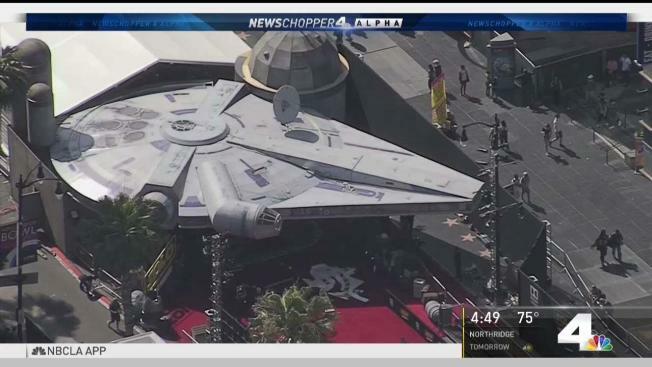 I love the movie, the story, the heroes"
Hollywood Boulevard was shutdown at Highland Thursday because the Millennium Falcon was blocking traffic. It’s all for the red carpet premiere of the latest Star Wars spin-off: "Solo: A Star Wars Story." It follows the tale of how Han Solo meets his trusty co-pilot Chewbacca years before they join the rebellion. Paul Bettany, Thandie Newton, Donald Glover, Woody Harrelson and Jon Favreau attended. Some fans showed up hoping to see some of the actors when they walked the red carpet around 5 p.m.
"I've been here for 15 hours, as always. I'm a super fan. I love the movie, the story, the heroes. This is my favorite movie ever," Luis Kezzer said. Another fan, also quite dedicated, came from across the pond to check out the premiere. "I prefer the spin-offs because they let the authors do other things, it’s different, and you get surprise. That’s the cool thing. It’s not the typical three movies trilogy," said Daniel Buron, who came all the way from Barcelona. The film, directed by Ron Howard, will be shown at the TCL Chinese Theatre, as well as the Dolby Theatre and the El Capitan. It will open nationwide May 25.